After the interruptions of returning from Bangkok and two heavy snowfalls, I'm getting back to a regular training schedule (almost). Rest — still a lot of snow and ice on the ground. 33:37/27:09 @ 5:36/4:32 - no break after 6k. Cold and windy going out, but with the wind coming back. Felt good on the way back, running comfortably - went from 4:46/k to 4:22. 7:30pm - club workout on the track. Total 12.3km. 100 jog/100 walk after each, about 3:00. Cold! Felt "good" from the first 1000 and ran hard from there. 34:15/28:42 @ 5:42/4:48 - brief walk after 6k. 4:00 - 16k in 1:26:42 @ 5:25/k - walk and stretching after 8k. Cold going out, but with the wind coming back. Felt ok, knee hardly sore at all. Lots of walking with Frank and Lorraine Tai of Los Angeles (here for the marathon), as we took in Ginza, Meiji Jingu shrine and Harajuku. Cheered for club members in the Tokyo Marathon (about 25 of them) until 1:30, then went to the Palace and ran 15k in 1:21:55. 10k at 28:57/27:33, then 5k in 22:22. Then went to the club's post-race party, always a fun event. Ate and drank too much. Great weather for the marathon, by the way, 6-7C, sunny, almost no wind. So course records set in both men's and women's divisions. Good shot of the leaders at 5.5k (following the pacers). Japanese favorites Fujiwara and Miyawaki (front), both of whom bombed out. Five other Japanese ran under 2:10, however, with two under 2:09. Nice photo of a wedding taking place at Meiji Jingu shrine. good session on wednesday bob. shame i couldn;t make tokyo this year, but hoping to be in japan later in 2014. A couple of nice 1000m splits there Bob. And I bet they felt comfortable too. 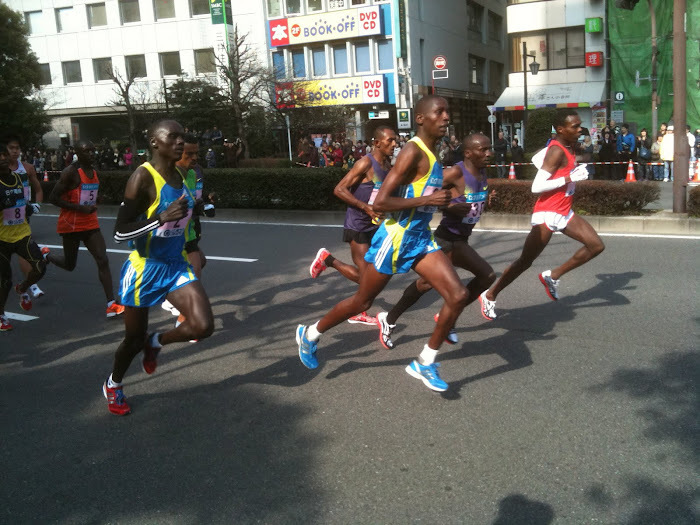 The two Japanese runners look to run very upright/tall when compared to others around them. A great shot. Hi Bob, I found your name through Japan Running News, as I now follow it everyday. I live in South Korea but travel to Japan three or four times a year, specifically the Yokohama area. Was there when the first big snow storm hit. Here is my blog related to running. Nice week Bob. Impressed by the 12kers and the track session. Fast running in the marathon. 5 under 2:10 is good depth - we haven't had 1 for a bloody long time! Thanks for the comment Bob. I know about your Tokyo running club. I usually don't do track type speed work but when I return to Japan again I might visit and watch you guys. I'm more of a progression/tempo run type guy. Also like you, I don't plan on doing marathons again, just 10K and half, I hope, but maybe Tokyo. We'll see. As far as my shoe collection, I have only 12 shoes now that I rotate as much as possible. I only run in racing flats. Transitioned to that about 18 months ago. Have Saucony, Nike, and Asics. I only buy them in Japan, I just like Japanese style racing flats.